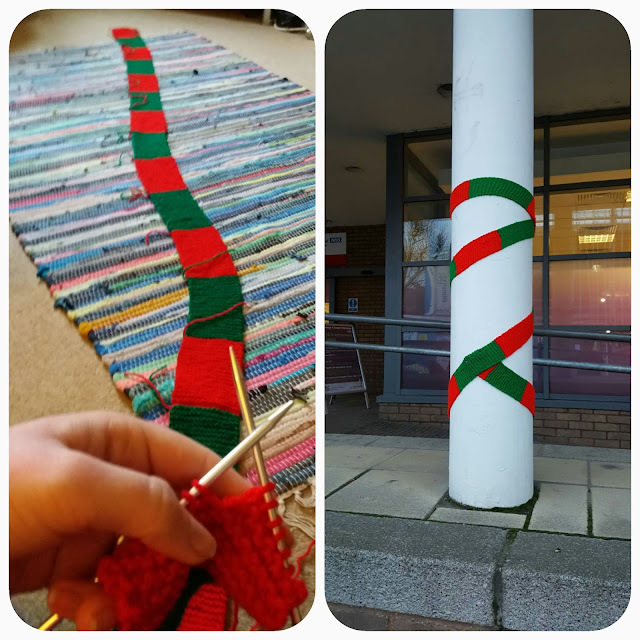 Before Christmas I received a email about a yarn bombing project at my local hospital. Yarn bombing is decorating the outdoors with knitted and crocheted items. The idea was to decorate the outside public areas of the hospital to cheer up patients and visitors. I was directed to knit a rectangle of 105" by 4" with a winter wonderland theme. To me Christmas is Red and Green colours. Here's a picture of the knitting in progress and the knit in place in front of A&E. I hope it brought some Christmas cheer. I would definitely take part in a yarn bomb for a good cause again.